Most residents probably don't realize the partnership that is needed for our beautiful downtown-scape to be adorned with hanging baskets of flowers. These welcoming bouquets placed along main street have four major organizations working together to make it happen. It first starts with the local group SPIGOT (Show Pride In Greenville Our Town), a small team of locals dedicated to using their gardening talents to benefit the community. They are the facilitators and organizers of "operation: hanging baskets". Next, the borough is needed to hold up their end of the deal, namely our hard working street department guys have to make sure all of the brackets that hold up the hanging plants are tightly secured and replacing any that need replaced. When the time is right, the baskets are ordered and are hung with the help of the street department. Next we move on to the maintenance of these plants. Left for a week with out water, we would have an ugly picture painted for any visitor to our downtown. The Greenville Area Chamber of Commerce is the next partner needed as it houses the water buffalo that is used to keep these plants from drying out in the heat. Lastly, we have the help of Keystone Charter School showing the importance of volunteerism and setting the example by coming out several times a week to take that water buffalo around and water the plants. Who knew! And just to have hanging baskets downtown! So take notice to the small things and the good things. Thank those who are committed to the work necessary to make this area a better place and find ways you can help out! It really does take a community, the whole community, to keep us on the course for that #1 spot on the list of Best Towns in Pennsylvania (thank you Record Argus for that encouraging yet still very realistic article in Wednesday's paper). We do have room to grow, so don't give up! It's not easy, but keep going! When you are ready to throw in the towel, look for that other person or group who is willing to come along side you and make it happen! Thank you to all of our community partners who are working to make the Greenville area a great place to live, work and recreate! The Mercer County Trails Association (MCTA)recently took an Anderson Bus trip to the towns of West Newton and Connellsville, Pennsylvania. Although the tour was certainly a great experience and a lot of fun, it was less of a field trip and more of a research/study expedition. What do these two towns have in common? The First 250 People to stop into the Greenville Area Chamber of Commerce 182 Main Street on the 29th between 9am and 11am receive a FREE canvas Shop Small Tote with exclusive coupons and specials offered by our local small businesses. Turn in a current dated receipt from a local small business from now until December 5th during our office hours of M-F 8am—4:30pm for a chance to win great prizes! Special Offers on Small Business Saturday! 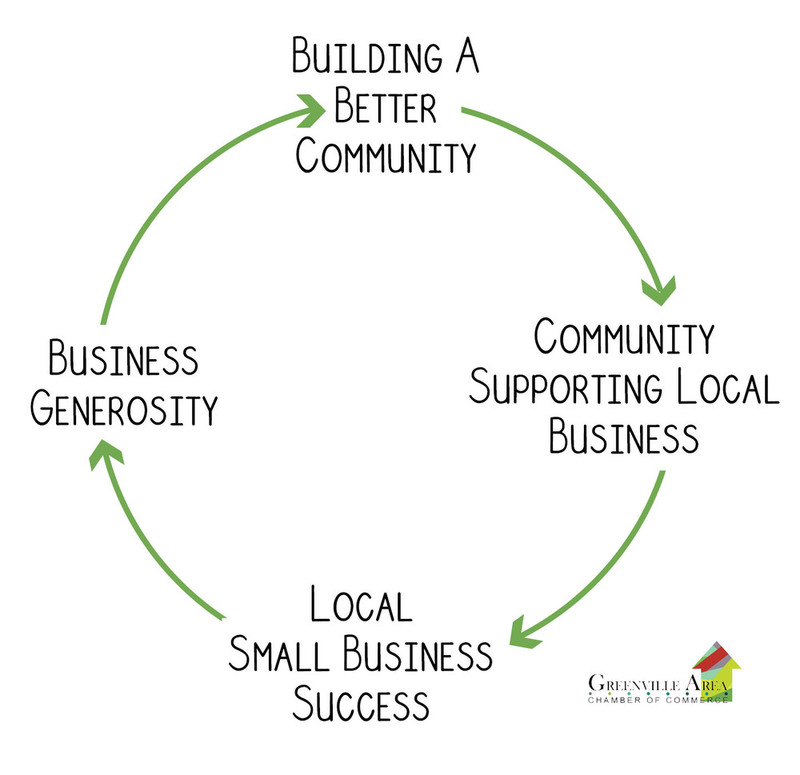 Small, Local Business support community - Community support your local small businesses! The following are members recently featured in the Record Argus who are Community Proud! Greenville natives, Chiropractor Jordan Bowen, DC and his assistant Nancy Szewczyk of Bowen Chiropractic Center are proud to be able to treat patients in the community. Greenville is a very friendly hometown and deserves the very best care. Bowen Chiropractic Center prides itself on providing this excellent and friendly care. Using many techniques including low force techniques, treatments are very pleasant and long lasting. Many insurances are accepted. If there are any questions feel free to check out the website at www.bowenchirocenter.com or call us at 724-588-3128! Now accepting New Patients! For more than 100 years Greenville Savings has remained locally directed and managed. We continue to thrive and experience significant growth thanks to the trust and support from the citizens of the communities we serve. Our friendly and helpful staff invites you to visit one of our three locations in Greenville, Hermitage or Neshannock and discover what makes us "Your Hometown Financial Institution since 1911". Hello, we are Bretton and Stacey Walberg, Greenville residents and owners of a small group of independent pharmacies which we call Walberg Family Pharmacies. We are proud to offer the guaranteed lowest Rx prices, a short wait time, excellent customer service, free delivery, a great selection of home medical equipment and our exclusive, free Care-Fill(tm) custom medication packaging service. We are committed to the highest standards of patient health and customer service and we were honored to have our Jamestown store selected as Pharmacy of the Year for the North East Region! Come check us out - you'll find we offer all the benefits of a national chain AND more! Making a commitment to shop local is the only way to help Greenville businesses stay in business. The staff at Lin's Tresses & Treasures is totally committed to accommodating the schedules and needs of our clients. Let Lin and the girls make you look your very best and help you fall in love with fashion! Thanks for your support. Greenville is a great place to live, work and play! David and Lori Reeves of Reeves Information Technology enjoy offering their computer technology services to our friends and neighbors here in Greenville and the surrounding community. At RIT, it's our pleasure to serve and grow in a small town. Allow our friendly, local company to serve you! Hello, we are Rhonda and Joe Yarzab, owners of The Medicine Shoppe pharmacy entering our 26th year servicing Greenville and the surrounding communities. Stop in and experience The Medicine Shoppe difference where we treat you like family. Can't find an OTC item you want, we can, and will keep it in stock especially for you. Take advantage of our many cervices, diabetic shoes, immunizations, or our Dispill individualized prescription packaging system, and specialized compounds prepared for you by our highly trained pharmacists. We also offer free local delivery when you are feeling under the weather or when the weather is keeping you in. So stop in, meet our friendly staff and give us a chance to earn your business, you will be glad you did!